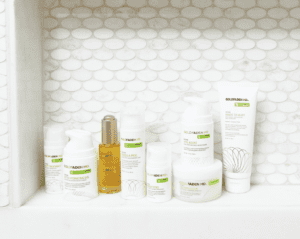 Actives refer to specific ingredients in a product formula that offer some therapeutic action that either nurtures, revitalizes, or protects your skin. In contrast, inactive ingredients have no virtue to heal or maintain your skin’s health, but serve instead to help transport or preserve the other active ingredients or to alter the physical characteristics of the formula such as color, feel or smell. Below are a few of the most beneficial actives to help achieve radiant, long-lasting, beautiful skin. Topical vitamin A plays a major role in maintaining the youth of your skin by boosting the process of cell regeneration. Vitamin A and its retinoid analogs stimulate skin cell renewal by increasing the rate of cell division. Through its powerful action as a signaling agent, vitamin A stimulates the binding of epidermal growth factor to your skin cells, thereby encouraging new cell growth. This helps keep your skin soft and smooth. In addition, vitamin A actually thickens your epidermis, which becomes thinner with age, and also improves the elasticity of your skin. Because vitamin A is a fat-soluble vitamin, it penetrates your skin easily to enhance texture, improve mottled appearance, and minimize wrinkling. Vitamin A helps reduce the number of destructive metalloproteinase enzymes that tear down your dermal matrix and it also stimulates vital collagen production. Finally, vitamin A’s impressive antioxidant properties allow it to neutralize the free radicals in the your skin that can cause cellular damage and accelerate premature aging. One of the most valuable ingredients known for healing aged or sun-damaged skin. As an ingredient in skin care formulas, vitamin B3 appears in two main forms: nicotinic acid (also known as niacin) and nicotinamide (also called niacinamide). It’s well known that certain lipids such as fatty acids and ceramide are critical for maintaining the structural and functional integrity of your stratum corneum, which, in turn, directly affects your skin hydration, softness and suppleness. Of all the natural lipids in your skin, ceramide is probably the most valuable. By supporting your barrier function, ceramide not only smoothes wrinkles, reduces sallowness, and boosts elasticity, it also acts as a signaling molecule that controls many of the vital functions involved in the life and death of your skin cells. Naturally, the ability to stimulate the enzyme responsible for creating ceramide out of palmitic acid and serine makes nicotinamide a very important anti-aging ingredient. Nicotinamide doesn’t inhibit the production of melanin, but it does interfere with the transfer of melanosomes to your keratinocytes (basically darkness being visible on the surface). Niacinamide has the age-defying ability to fade age spots or (technically known as hyperpigmentation). Nicotinamide is gentler than retinoids and glycolic acids, making it an excellent alternative for those who aren’t able to tolerate more aggressive treatments. Only humans, apes, guinea pigs, and one species of fruit-eating bat lack the ability to produce their own vitamin C. To make matters even more challenging, vitamin C is a water-soluble vitamin. This means that a great deal of the vitamin C we take in gets excreted before our body can actually use it. In addition, although oral supplementation and eating foods rich in vitamin C (such as bell peppers, broccoli and strawberries) is vital to overall health, it’s not a very effective means for nurturing your skin. Due to the fact that the absorption of vitamin C is drastically limited by active transport mechanisms in your intestines, very little of what you take in orally ever makes it to your skin cells. The only effective method for replenishing the vitamin C in your skin is to apply it topically. In fact, it’s been shown that applying vitamin C to the skin is 20 times more effective than oral ingestion. Another advantage to applying vitamin C topically is the fact that once it s absorbed into your skin, it can’t be washed or rubbed off. Significant amounts of it continue to remain active in your skin for up to three days! The ability of vitamin C to revitalize aging skin is largely due to its beneficial effects on collagen. Collagen is a tough, fibrous protein that is relatively inelastic and very strong. It supplies the basic framework that gives your skin its form, firmness, and strength, while elastin provides flexibility. Overall, the amount of new collagen that your skin produces declines with age, while the rate of its destruction increases. 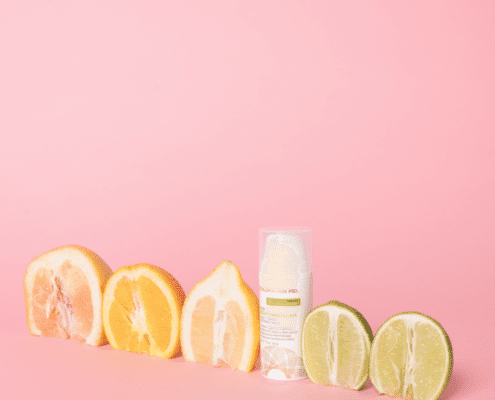 Fortunately, topical vitamin C has been scientifically proven to help stimulate collagen synthesis. It also helps block the production of enzymes the break down collagen, making it one of nature’s most effective anti-aging nutrients. 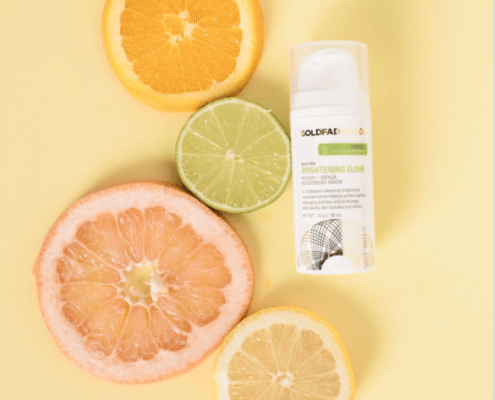 Vitamin C is not only essential for collagen production and maintenance, it’s also a very powerful antioxidant that neutralizes free radicals in your the skin. Technically speaking, vitamin D isn’t a true vitamin at all. A vitamin is defined as a substance that’s essential to daily life, but which can’t be manufactured by the body. Since your skin can produce approximately 10,000 IU of vitamin D after just 20-30 minutes of summer sun exposure, it doesn’t really fit the profile. In fact, Vitamin D more closely resembles a hormone than a vitamin. Hormones are chemical messengers that function by binding to specific receptor sites on your DNA in order to produce a targeted biological response. The active form of vitamin D, called calcitriol, is the most powerful hormone produced by the human body. It has the ability to activate over 2000 genes, many of which are involved in critical aspects of skin cell metabolism, growth, repair and protection. Your skin needs to replace about 40,000 lost cells every minute. As these replacement cells detach from the base layer of your epidermis and start their 2 week journey toward the surface, they go through a complex series of changes in both form and function. The rate at which these cells divide, the nature and timing of their changes, as well as their transit time to the surface, are all directly controlled by growth factors and other molecules that are triggered by the presence of vitamin D.
The benefits of vitamin E in terms of your skin and general health are significant. When applied topically, vitamin E is a powerful antioxidant that helps protect your skin cells from ultraviolet light and many other factors that can produce harmful free radicals. Vitamin E’s ability to counteract these age-causing free radicals makes it an ideal ingredient in any anti-aging skin care formula. As an important regulator of vitamin A, vitamin E also helps maintaining smooth, younger-looking skin by diminishing age spots, reducing wrinkles, and improving water retention. The powerful antioxidant activity of vitamin E also makes it an effective additive in many sunscreen formulas. Vitamin E is the most abundant fat-soluble vitamin in your body, with alpha-tocopherol being its most biologically active form. The free radical fighting properties of Vitamin E are closely linked to other antioxidants such as vitamin C, glutathione and CoQ10 which help regenerate it. As an antioxidant, Vitamin E is most effective in its natural alcohol form (alpha-tocopherol) rather than its acetate form (alpha-tocopherol acetate). The acetate form lacks the penetration ability of alpha-tocopherol and offers less antioxidant benefits, a fact that’s important to remember when reviewing the labels of skin care products. Besides being rich in antioxidants that assist in the repair and conditioning of your skin, blackberry extract also contains kojic acid and alpha arbutin. These unique plant compounds are natural skin lightening agents that have a proven ability to brighten skin tone and reduce the appearance of unwanted hyperpigmentation such as age spots and freckles caused by the sun. One of the best health-promoting ingredients Dr. Goldfaden has found to help revitalize and rejuvenate the skin is red tea. As a matter of fact, all of our products contain a concentrated red tea extract or tea blend as part of their formula. 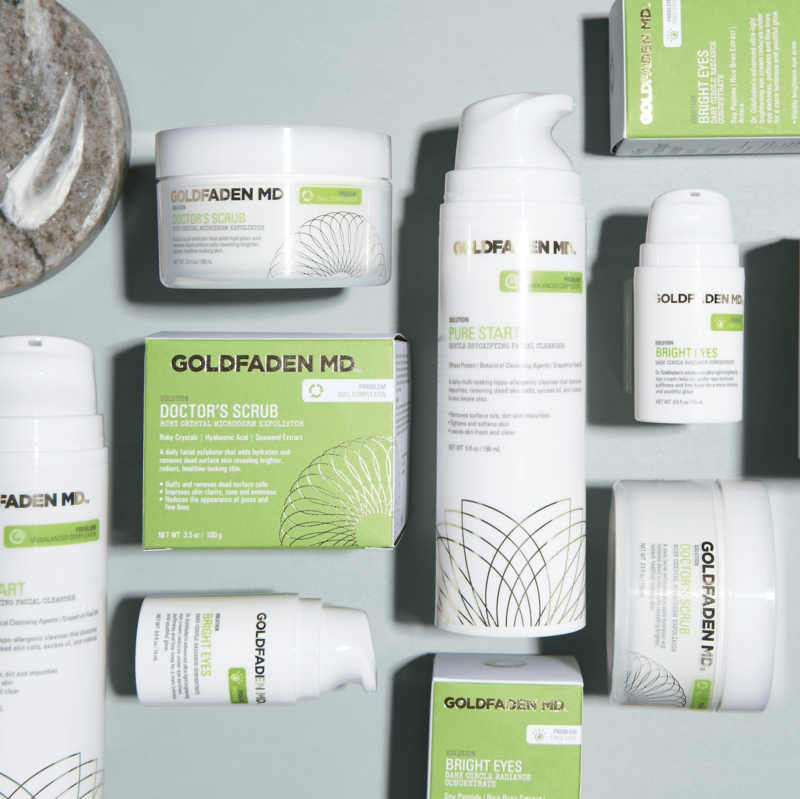 That may give you an idea of how indispensable he believes this substance is for its ability to regenerate new skin cells, fight the visible signs of aging, and provide potent free radical protection.